Dozo sushi is delicious and aesthetically pleasing. 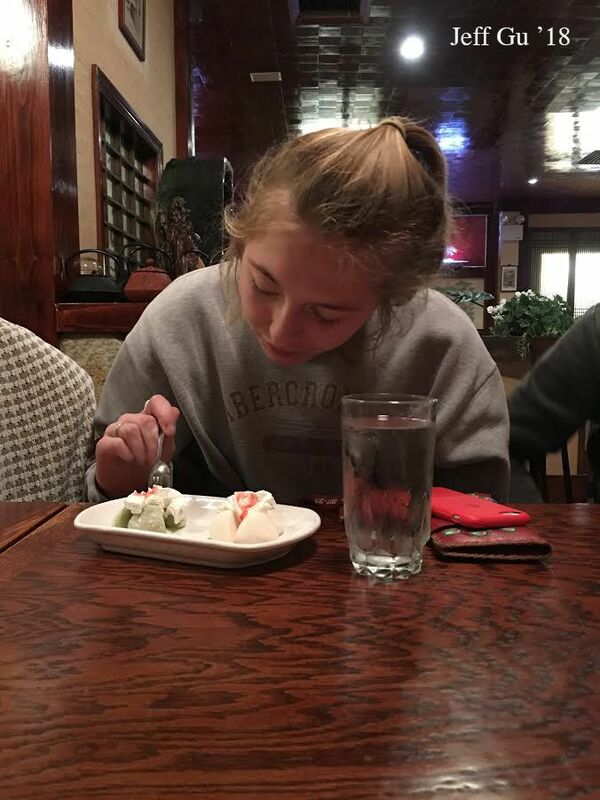 Erin Knox ’18 indulges in Mochi, a delicious Japanese dessert, eating away all her sorrows after a tough IMBL loss. Located a short eight-minute drive from our very own Hopkins Forest Road lot, Dozo Asian Bistro and Sushi is the shortstop, after school, after-activities meal that should replace student obsession with the Athenian Diner. Dozo, meaning ‘go ahead’ or ‘go frst’ in Japanese, is a restaurant mantra observed by the staff from the moment Donasia Gray ’18, Mike Lazarre ’18, Siraj Patwa ’19, Erin Knox ’18, and I entered to our final ‘good-nights’ and ‘have-a-nice-days’ an hour later. Customers already seated, families of three and four and couples young and old alike, were in their own small bubbles extending just the length of their tables, and no farther, each heartily engaged in raw fish and conversation. After being seated at our own table, the fve of us were immediately treated to warm towels in preparation for the meal. Our glasses were fllled, and over the course of the meal refllled again and again, in a timely manner. Patwa ordered the Spicy Salmon Roll and the elaborate spicy tuna, avocado, crab salad, tobiko, nori, and a cucumber Volcano Roll. Lazarre ’18 had the Salmon Avocado Roll, a dish he thought was “good.” Gray, having already eaten, had the miso soup. Knox ordered three Avocado Rolls, the Rainbow Roll and a Green Tea Mochi dessert while I followed Patwa’s lead with a Volcano Roll and then a Yellowtail Roll. Knox, after receiving only two of her requested three rolls, commented, “Where is my other avocado roll?” She decided not to make a scene. Joking aside, Knox added, “The mochi was frosty. At first you anticipate you’re going to bite into a Turkish delight. Your teeth perforate the paste-like exterior and sink into a frozen tundra of sugary vanilla ice cream. The presentation was twelve out of ten. I wasn’t expecting the whipped cream and cherry on top. Would eat again.” Mochi is a Japanese rice cake with an ice cream flling. The sushi was as expected. It did not disfgure minds or lead to any outrageous shout for glee—it was good. The food arrived without too long a wait and held our attention with each new bite. Dozo is set apart, not only in its offer of well-priced and delicious cuisine, but also in their quick and smile-accompanied service offered and the tight intimate atmosphere given to small groups looking to laugh, chatter, and connect. 4/5 Stars. 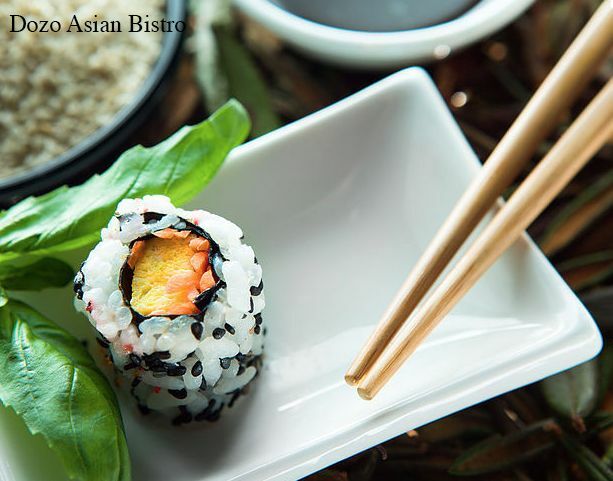 Dozo Asian Bistro and Sushi has a single location in New Haven. For a great, intimate atmosphere, good sushi, and fantastic service, head to 1450 Whalley Avenue in New Haven, CT.